For a Bridgeport alderman, Stearns Quarry Park is a source of pride-and a reminder of an ancestor's death. 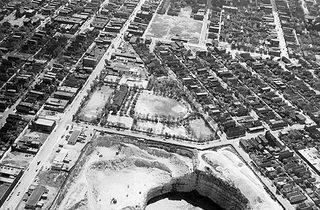 Photograph: Courtesy of Chicago Park District Stearns Quarry, opened in 1833. For Balcer, the park, an important project for his green-space-deficient ward, also strikes a personal chord. 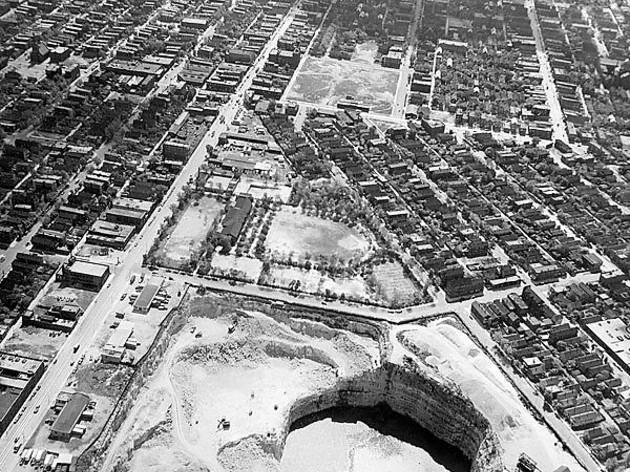 As a boy, he learned from family members that his paternal great-grandfather, a young German immigrant, was employed at the mine around the turn of the century to excavate limestone for lakefront retaining walls. One sweltering summer day at Stearns, Balcer’s great-grandfather died from heat exhaustion. Balcer, a Mayor Daley loyalist and an ex-Marine awarded a Purple Heart for his service in Vietnam, has spent his whole life in the meat-and-potatoes Bridgeport ’hood on the city’s South Side. His family has lived near Stearns Quarry for generations. The 59-year-old alderman, appointed by Daley in 1997, grew up on Stark Street, just northwest of the mine. “People who lived east of Halsted 40 years ago tell me they could feel the vibrations from the blasting inside their houses,” Balcer says. After 136 years as a working quarry, Stearns closed in 1969. The city used the pit to dump “clean” construction waste (nontoxic debris such as metal and wood), filling in the hole over a 15-year period, says Claudine Malik, project manager for the Chicago Park District (CPD). “When the dumping stopped,” she says, “the idea for the park started.” Five years ago, after securing a permit from the Illinois Environmental Protection Agency to close the landfill, the CPD started building the $10 million park, funded in part by an Open Space Lands Acquisition and Development grant. The design incorporates many ecofriendly strategies, Malik says. Pipes direct all storm water into the pond and wetlands instead of the city’s sewers. The base of a small waterfall and the steps down to the water are made from recycled sidewalk slabs. Clay that lines the pond was salvaged from the Block 37 dig. And the Park District planted native flowers and grasses to reduce the need for herbicide and fertilizer. Balcer says he’s delighted to see the park become a hit with locals who use the space to fish, fly kites, play soccer and jog. Paleontology buffs can look for tiny fossils of ancient marine animals in boulders on the hilltop. This winter, sled heads no doubt will flock to the park to attack one of the highest hills in the city. It’s a place, Balcer likes to think, his great-grandpa would be proud of.